Third of Yolen’s fantasies (White Jenna, 1989, etc.) about the matriarchal land of the Dales, where women trained in mirror-magic can call forth dark twins who appear by moonlight or candlelight. This one, however, has turned into a family saga in more ways than one. The text includes ten songs co-written by Yolen’s son Adam Stemple, and otherwise is cluttered with annoying sections headed “The Myth,” “The Legend,” “The Ballad,” “The History,” and so forth. 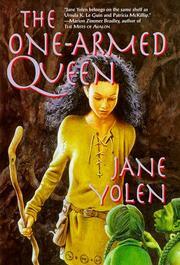 The story, when we finally get to it, mostly concerns the children of Jenna, the White Queen. Her adoptive daughter and heir, the one-armed warrior Scillia, is rebelling against Jenna’s strictures and training. Meanwhile, King Kras of the Garuns, the Dales’ patriarchal rival, is fervently attempting to persuade Jenna’s sons Jemson and Corrie to challenge their sister for the monarchy. The expected complications ensue. An all-singing entry in this waterlogged and insipid series.